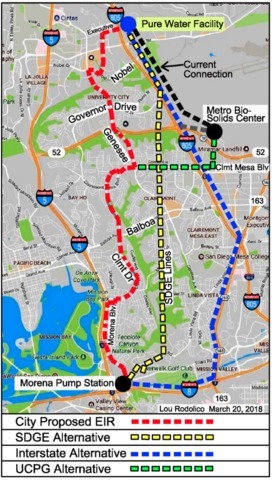 San Diego City Council Tuesday night unanimously passed the location of a high-pressure underground pipeline to move sewage from San Diego's Morena treatment plant to a facility in Miramar. Residents say they're concerned the pipeline could break, wreaking havoc on the area. "Our concern is if that line was ruptured, bnecause it's under so miuch pressure, that it would spew raw sewage into the environment," said Ruth DeSantis, a longtime U.C. resident who heads the area's community foundation. DeSantis added that neighbors are concerned over traffic, noise, property values, and even smells seeping out of vents. There's a middle school, park, and hundreds of homes nearby. The city says it took various measures to minimize health and safety hazards, although some impacts like noise and traffic are unavoidable during construction. San Diego spokesman Jerry McCormick added that sewage geysers would not be possible under the pipeline system. "Unlike a potable water system, where there are multiple loops to provide continuous pressure and in time of a rupture must be isolated by multiple valves, often times creating large releases of water, this system will not operate like that," McCormick said. "Instead, if there is a rupture, we can shut down the pumps and the flow will come to a very abrupt and quick stop." Community groups in University City are now teaming up with those in Clairemont to fight the project. "We can put everything in Clairemont and Clairemont is sleeping, and I just wanted to say, that's not right," said Roseline Feral, of the nonprofit Clairemont Town Council. The city is aiming to have about a third of its water supply be reclaimed water by 2035. That would help combat shortages and price increases.